Hi loves! This is the page on my blog where I share all things essential oils! 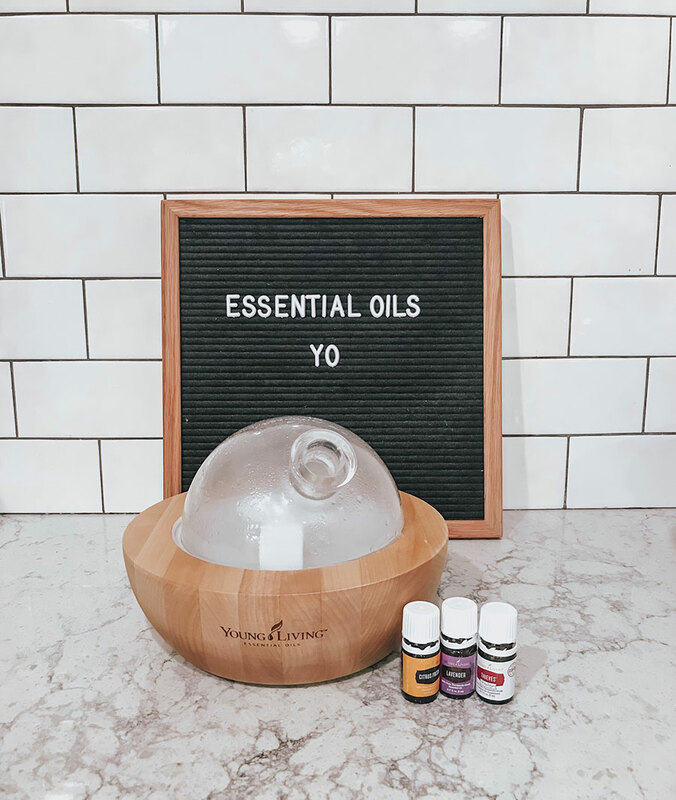 I’ve been passionate about essential oils for years, and am so happy to finally be sharing that passion with you guys here on the blog! As you may or may not know I switched over most of my beauty products over a year ago to safer products with Beautycounter. In our home, we have switched over most of our cleaning products, laundry detergents, and everyday products to better-for-us brands. We are ALL about finding better solutions that are safe, free of harsh chemicals, and make us actually feel good about using them. Essential oils can be used for SO many things. We diffuse them, roll them onto our bodies, and even ingest them (any Young Living Oil labeled Vitality have been recognized by the FDA as ingestible). In fact, I’m drinking a cup of tea made with essential oils as I type up this post. I just boil hot water & add one drop of lemon & one drop of thieves (great for cleansing out your system & also providing immunity support). Young Living also offers a TON of plant-based personal care and household items that I’m starting to get into as well. My first favorite being the Thieves household cleaner! 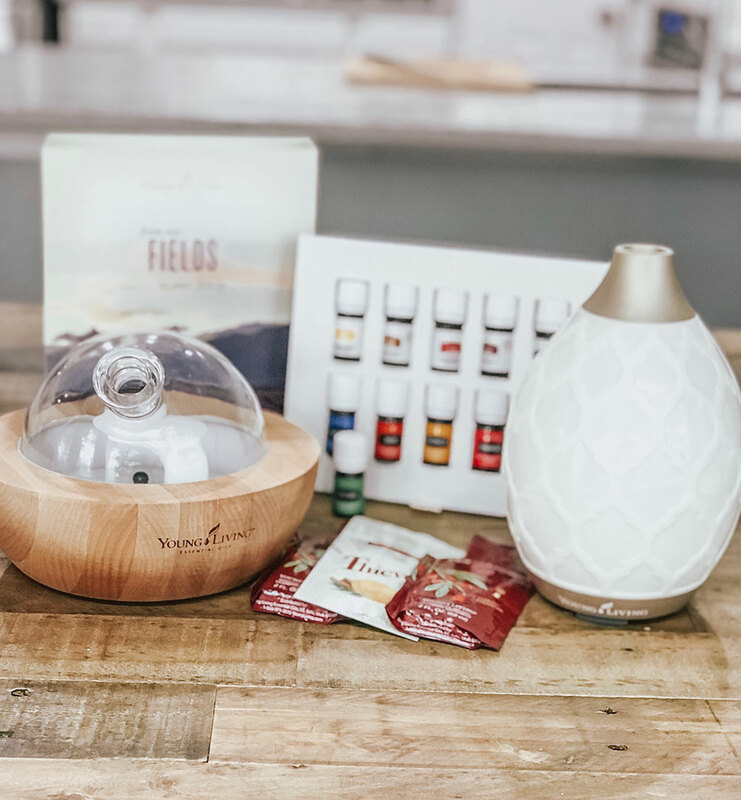 The best way to get started with essential oils is with the Young Living Premium Starter Kit! The kit is AMAZING. You’ll get 11 essential oils, a diffuser, samples of the Thieves household cleaner and nutrient-packed wolfberry supplement Ningxia Red, a roller top to pop on one of your oil bottles, and info on how to use your oils! When signing up for your starter kit click HERE so that I will be added as your sponsor & enroller. You have to sign up with someone, and if you don’t choose anyone Young Living will randomly assign you to someone. I will be notified via email when you sign up, and I will be able to send you a welcome email, and welcome you to our Oils community! We have a great Facebook group full of women who love to share all of their oils tips! I will send you all of the info via email! Do I have to sell essential oils when I sign up as a member? No, but you do have the ability to. So if you want to share your personal link with family or friends you can earn $50 for each person who signs up. You can also earn a percentage on all of their future orders. It can be a HUGE business if you want it to be, or you can just sign up to have the discount for personal use. Totally up to you! How the heck do I know what to do with my oils when they arrive? We have two Facebook groups that I will plug you into once you sign up! There are SO many tips & tricks in these groups, and an AMAZING community of women. I also share lots of tips & how to use your oils over on my @leeannehealthyliving Instagram account! Okay, I wanna turn this into a business. How do I do it? I got you! I joined the fastest growing team in Young Living, and I was in the top 25 of the entire company for new member sign ups in January 2019. Our team is growing like a weed, and we are here to help you succeed. We have Facebook Groups that are VERY active. Our main mentor goes live on the group like every single day. We have weekly calls, and we even have a group text thread that you can join via GroupMe on your phone! It’s such an amazing community, and everyone helps each other out. Why Not Just The Oils on Amazon or at Whole Foods? Young Living is the leader in the essential oils movement, and not all oils are created equally. Young Living has a “Seed To Seal” standard that ensures you are getting the highest quality product without any dilution or chemical additives. You can read more about how important this is here. I hope this has been helpful. If you have more questions about essential oils feel free to email me at lifebyleeblog@gmail.com!